Oh my, I'll certainly look forward for those two. Too bad there's nothing for PoFV, SWR, SA, TD, and DDC for now. They could've go for the Sexagennially Empurpled Cherry Blossom, the Nawi Clan Ascension to Heaven, the Komeiji Sisters' Past (or the Underground Agreement), the Royal Clan Encounter with Kaku Seiga, and the Creation of the Shining Needle Castle. And there are lots other things to work on. Touhou histories are all so delicious. Also, what kind of support do they need? Is Neko the artist for the Troupe, or did he only make the cover art? Artist of the cover art, but he is also likely the character designer for the project. Need confirmation for this, though. Neko did the concept art for some characters, including the past Hijiri and Mokou you saw on the first page. He also did the earliest iteration of the storyboard. For this reason, I suggested them to list him as "Assistant Director" in the credits, because the more in-depth storyboards and layout works are done by other people. He's quite popular on Pixiv now, but calling him "one of the best" isn't a good idea. He wouldn't approve of it too. It's great to see another Touhou fan animation project being made, and the kinds of stories that might be animated pique my interest. Something else not on the website: stage performance of the theme song during August's Touhou Only 4 convention at Chengdu. The singer 瑶山百灵 (Yaoshan Bailing) had only received the song one day ago. Fujimi Plateau Hospital is a famously scenic sanitarium in Suwa. Well, damn. This looks GOOD. And focusing on the Sealing Club folks? Now they have me curious how they're going to fit this all together. Gonna keep an eye on this, see if it transcends the fate of [insert name here, there was like 3 of them] which lasted a few episodes and fizzled for one reason or another. Also first post yay hello hi. Real life references? Man this is gonna be amazing on so many levels. I wager this will trump even Maikaze in terms of dedication. The fact that it's exploring established events in Touhou "canon" instead of an all-new plot does naturally imply an attempt to stick to.... well, both canon and RL research. Not completely necessarily, mind you, but it'd be pretty shoddy to have a series based around exploring what happened during canonical events (that also are related to real life stories and locations) without actually researching real life stories and locations. It's refreshing to see them on the ball with this. Most of those canonical events are shrouded in a good amount of mystery. I'm curious what their idea for why the Lunar War happened will be, etc. I really like the perspective they've decided to take with this project. Considering that a lot of the back story behind the characters are either spread thin through ZUN's texts or just historical common knowledge, it's good to have most if not all of that in one entire project so it's a lot easily accessible. This has a lot of potential and hopefully it pushes through! The mere fact that the sealing club is involved makes it a million times better than maikaze or manpukujinja. And I have a weird feeling that one day I would be channel-surfing Chinese satellite TV and see scenes of this pop up. Are those really the prequel videos? I mean, seriously, 100 yens? A dollar for a video? Are we sure it's not just the cover art? Man, you've been had. I fell for the same thing the first time I saw this too. Apparently the ¥ symbol can also be used to denote the Chinese currency "yuan", it's misleading yes but if it's too good to be true then it really is. 100 Chinese Yen is not the same as 100 Japanese Yen. 100CNY is roughly US$16.33. Now that sounds about right for a DVD, doesn't it? 普装版 is for preorder of the standard edition, which includes a DVD and supplementary manga. 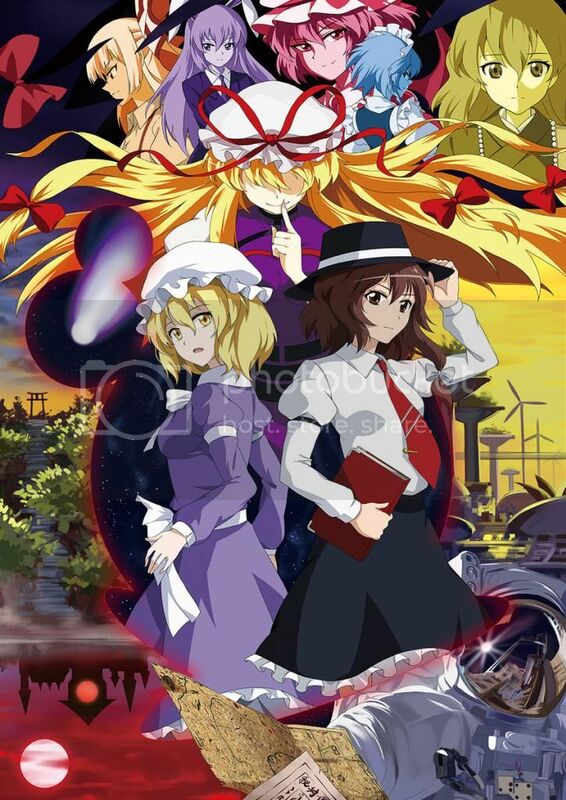 特装版 is for preorder of the special edition, which has different cover art as well as many extras, including a keychain featuring Maribel and Renko. 场贩 means convention edition, and 通贩 means retail edition. Wait, I thought the Chinese uses yuan. Regardless, they both use the same symbol for their currencies so that could get confusing. Anyways, can't wait until its released! Hope they sell enough to continue their en devours. Figures that would be the case. Well, that means it really is a DVD. Good news, alright. Thanks for the correction. Thank you for explaining the differences between them. Another thing, though. Does it say anything regarding what it'll cover in the video, how far it'll go, and does it ship overseas? Does that website do international purchases? I might consider buying this one. Due to regulation re: audio/video products, it's at least a legal hassle to ship any CD/DVD through Chinese customs. They are not shipping this overseas. At present, they have no plans for selling the physical disc in places beyond China and Japan. If there is another way to support them, I would be glad to know what to do. Please don't tell me this animation will go into obscurity like the Anime Tenchou x Touhou . I was really looking forward to seeing this. So, I don't know if this is real or a hoax, but the OP is (allegedly) up now. Yeah, I picked it up over the weekend. Haven't had a chance to watch it yet, but I did see the OP sung live at least.